SIM scores: Signed, sealed …delivered? Everything you need to know about Ofwat’s catchily-named Service Delivery and Financial Resilience reports, and why it matters. Resilience. It’s transcended buzzword and become standard fare in nigh-on every water-related conversation going. 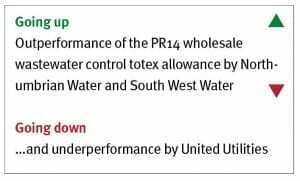 This is because part of PR19 – the water regulator’s price review (see analysis, p12) – calls for “resilience in the round”, whereby companies must find a holistic approach that covers operational, financial and corporate resilience. Last month’s service delivery reports from Ofwat were part of its ongoing approach to monitor this and make sure it’s being delivered. So what did they tell us? There’s a rise in customer satisfaction across the industry but it still lags behind other sectors. The response (or lack thereof) to the Beast from the East in March 2018 was painted in a particularly dim light. 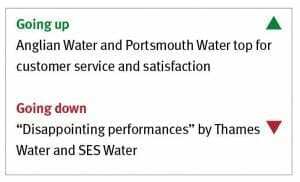 For customer satisfaction, Anglian Water floated to the top, followed by a buoyant Portsmouth Water. Both Southern Water and South West Water showed marked improvements, while Thames Water and SES Water fell to the bottom of the pile. We also learnt that across the sector, more water companies have improved performance on pollution incidents and internal sewer flooding, but nearly half of them failed to meet stretching targets on water supply interruptions and leakage. With regard to financial performance, Ofwat said it was pleased companies had looked further ahead in assessing their financial viability, but added that this now needs to be matched by greater clarity in their explanations of payouts to shareholders. What’s the point of all this? Well the aim is for companies to be prepared for all potential threats to service delivery, which could mean anything from drought and flooding to Brexit and skills challenges to cyber-attacks. So it’s Ofwat trying to shut the stable door before the horse bolts, in essence. If that isn’t enough to persuade you that this matters, Ofwat also said it will take into account companies’ performance across all of these areas when making decisions later in 2019 about the bills customers will have to pay between 2020 and 2025. The service and delivery report opens by saying the sector outperformed the allowances laid out in PR14, albeit marginally (by less than 1 per cent). But when compared with the same reports for 2015/16 and 2016/17, this is a reduction in “outperformance”, because more cost savings were included in those years. • 67 per cent of performance commitments were achieved across the sector. • This is down from 69 per cent in 2016/17 and 70 per cent in 2015-16. • The sector earned £151 million in outperformance payments (which are made only when customers receive a higher level of service than promised). It also noted that following the introduction of the totex and outcomes framework, there’s quite a distance between those who are floating and those who are floundering, with Severn Trent Water and South East Water outperforming against totex allowance, while Thames Water, Dwr Cymru and Affinity Water underperformed against their cost allowance. By way of explanation, it said “typical drivers of underperformance have been increased and accelerated investment in resilience schemes; investment to meet environmental requirements; and additional expenditure to reduce leakage”. Ofwat outlined in the not-too distant past a “clear expectation” that companies should implement their own forward-looking metrics on the issue of resilience as part of their PR19 business plans, with a brief that they should “focus on what matters to customers”. The service incentive mechanism (SIM) scores for 2017/18 see Thames Water rank bottom with a score of 78.4, closely followed by SES Water with 78.7 (compared with an industry average of 84.6). Thames Water told Utility Week it was “disappointed” with the results, but added it was confident of marked improvements in future reports, because following recent extreme weather conditions the company has “reorganised” itself to do much better, and invested record amounts in improving infrastructure, customer service and efficiency over the 2020-25 period. Anglian Water was the top performer with a score of 88, followed by Portsmouth Water with 87.9. Elsewhere, Ofwat concludes there have been “marked improvements” from both Southern Water and South West Water, in response to which Karen Sharpe, head of service delivery at Southern Water, said the company is “working incredibly hard”, but acknowledged that there is “plenty of hard work ahead”. Looking forward, Ofwat says it will introduce the developer services measure of experience (D-MeX) to incentivise water companies to provide an excellent customer experience for developer services (new connections) customers. Some companies experienced issues managing the impact of the rapid thaw that followed the Beast from the East in late February and early March 2018, which meant an onslaught of burst pipes, and inevitable subsequent knock-on impacts on leakage and supply interruptions. • Five companies advised in their annual peformance reports that they were on track to meet either their supply interruptions or leakage performance commitments before the freeze-thaw event, but failed as a result of it. The report says performance commitment levels were more stretching in 2017/18. It acknowledges “real efforts to reduce leakage”, but then asks companies to go further still. • Pollution incidents – 13 per cent more performance commitments achieved. • Internal sewer flooding – 40 per cent more performance commitments achieved. • Water quality contacts – 15 per cent more performance commitments achieved. • Leakage – 17 per cent fewer performance commitments achieved. • Water supply interruptions of more than 3 hours – 41 per cent fewer performance commitments achieved. • Water quality compliance – 44 per cent fewer performance commitments achieved. • Water consumption – 10 per cent fewer performance commitments achieved. 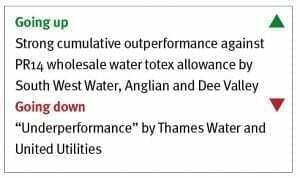 The report also acknowledges that Severn Trent Water is close to exceeding its wastewater outperformance cap, as it has outperformed on all of its in-period wastewater outcome delivery incentives. In response it is to increase Severn Trent’s levels of service for internal and external sewer flooding and category 3 pollution incidents performance commitments and reduce the outperformance payment incentive rate for external sewer flooding.